Six years ago at a major tiger conference in Kathmandu, Nepal pledged to double its population of wild tigers by 2022. But that target now looks unattainable — not because of poaching but because of habitat destruction in the Tarai. In 2010, Nepal had 121 adult tigers and that number has grown to 198 today mainly due to an effective anti-poaching campaign and the expansion of protected areas. 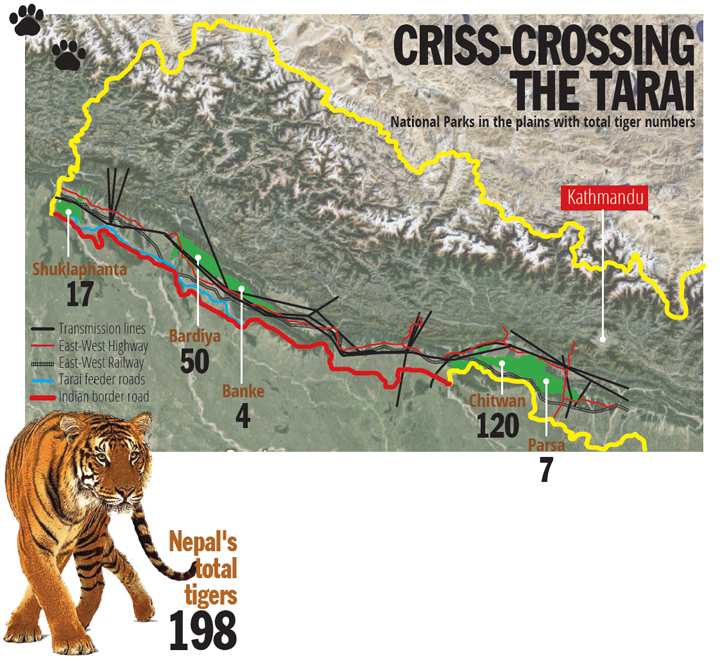 But the tiger’s range in the Tarai is seeing an explosion of the human population, urban expansion, the spread of highways, and transmission lines and irrigation canals criss-crossing the plains have fragmented the tiger habitat. 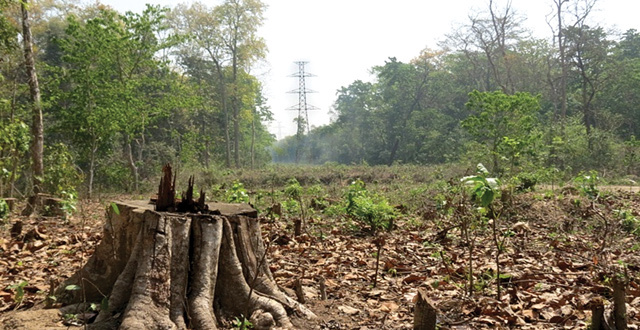 ROAD TO DESTRUCTION Construction of transmission lines through protected forests is also destroying tiger habitats. “Poaching is no longer the biggest threat to tiger conservation, it is the haphazard construction of roads, railways and other infrastructure,” says Santosh Mani Nepal of World Wildlife Fund (WWF) Nepal. After protests over the proposed alignment of the East-West Electric Railway, which could have divided the Chitwan National Park into two islands, the Department of Railways is now designing an alternative route. But simply circumventing the core area of the park will not be enough to protect the park in which most of Nepal’s tigers live. “Tigers roam around as far as the foothills of the Mahabharat range, so building a railway through the buffer zone instead of the core of the sanctuary is not enough. We need underpasses to allow unrestrained movement for tigers,” says Chitwan National Park warden Ram Chandra Kandel. The railway will not just threaten Chitwan, but the entire Tarai Arc Landscape – a jungle corridor for tigers and other wildlife. Besides the railway, Nepal is also building feeder roads in the Tarai, expanding the East-West Highway, new transmission lines and irrigation canals. India is also building 550 km of road embankments along no man’s land, which threatens to flood Nepali territory and also restrain the cross-border movement of tigers. WWF Nepal says such 'linear infrastructure', if built haphazardly, could cause the tiger populations to dwindle again by destroying their habitat, restricting movement and affecting genetic dispersal. “This is insane: decades of investment and effort in conservation are at risk because of the reckless infrastructure building,” says Santosh Mani Nepal of WWF Nepal. 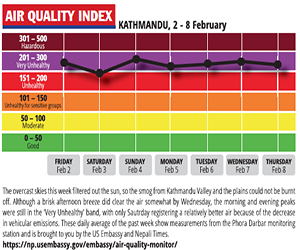 To be sure, Nepal desperately needs better connectivity, greater agricultural productivity and economic growth, but conservation experts say it should not be achieved at the cost of endangering already endangered species. Nearly a fourth of Nepal’s total area has been set aside as national parks and wildlife reserves, with 20 protected areas and 13 buffer zones. More than 10,000 sq km of the country’s territory can be considered tiger habitats. But experts say the total area is deceptive because if the territory is criss-crossed by railways, highways, transmission lines or irrigation canals the habitat will not be conducive to tiger conservation. Construction of infrastructure can be made wildlife-friendly, although it will cost more. Knowledge of wildlife migration routes can be taken into account to build wildlife passages over highways and rail lines. Most tigers prefer to walk along predictable routes, and WWF Nepal has identified five crossing points in Kailali, Kanchanpur and Bardiya and has proposed wildlife under-passes to facilitate their movement. At least 10 wildlife passages have been proposed along the Narayangad-Butwal section of the East West Highway, which is being widened with support from the Asian Development Bank. WWF India is also lobbying with the Indian government to build multiple under-passes along border roads to allow unrestrained trans-boundary movement for tigers. Even if these measures are not taken, Nepal’s tiger population could reach the magic target of 242 tigers by 2022. 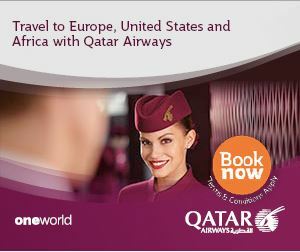 But habitat fragmentation could soon dwindle the population of the endangered big cats after that.